From my world to yours, I offer this simple three chord wonder. An "I can't believe it's not butter" view of Christianity. Toms are Evans G1 clears for the resonant heads and either Evans G2, G1 coated or Remo Pinstripes, depending on what I'm doing. Usually Vic Firth 7A woodtips but I was given some Wincents which I quite like. 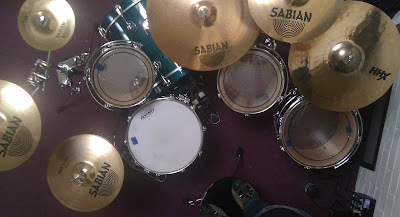 I also keep plastic and metal brushes and a set of meduim beaters for smooth cymbal rolls in the bag. Having used all sorts of hardware and setups over the years, this one suits me well at the moment. Easy to add bits to and to setup in different sizes, depending on what I need. I'm a christian, I'm a Husband and I'm a Dad. Then I'm a Drummer, a Worship Leader and a Sound Engineer. I like God and the simple version.